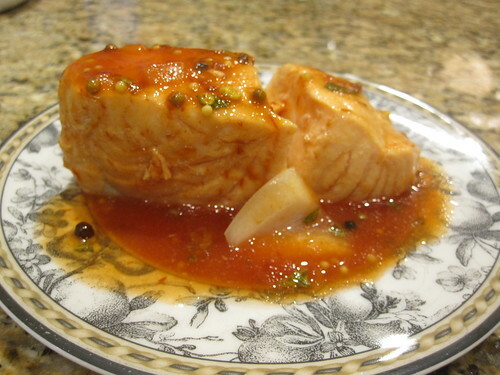 This Pickled Salmon recipe is a family favorite served at a well known Montreal steakhouse. As far as appetizer recipes go, this one is a winner because it is prepared days ahead of time and keeps well in the fridge for at least a week. This dish is tried and true – you will land up with the most delicious fish you ever tasted. After three days, you will have a nutritious and incredibly delicious salmon dish to enjoy with family and friends. a note from Mom….The salmon can stay in the fridge for three weeks, if it lasts that long. Into a pot add the 3 cups of water, slice in one onion, add the collar, tail or skeleton of the fish simmer for 30 min , you will have your fish stock. once that is cooked strain, throw out onion and bones and put the broth back into the pot. add fish fillets and cook for 7 – 10 min, (no More) you may have to do this in 2 batches, do not crowd the fish, let it cook gently so it will not fall apart. Combine vinegar, sugar, chili sauce, strained cooked fish broth, add spices and pour over the fish. cover and refrigerate for at least 3 days before tasting.